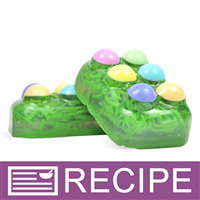 This festive soap resembles colorful Easter eggs sitting on top of lush green grass. Its lovely scent combines orange, lime, tangerine, and thyme giving it a sweet springtime smell. Suitable as an Easter basket goodie! 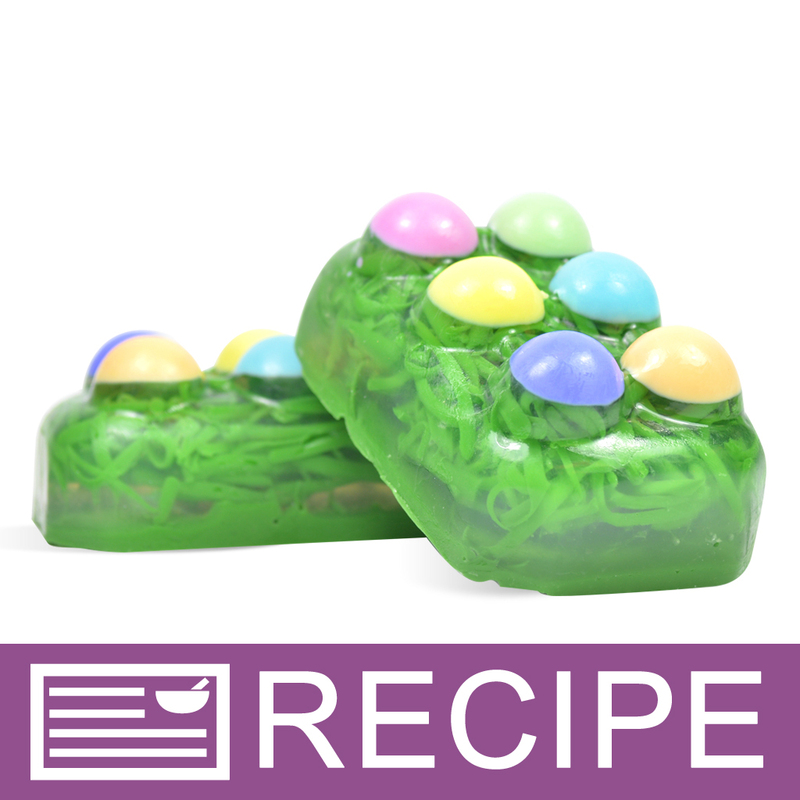 This recipe was used in the Simple Secrets video "Removing MP Soap from Plastic Molds." INCI Ingredient Label: Propylene Glycol, Sorbitol, Water, Sodium Stearate, Sodium Laureth Sulfate, Sodium Myristate, Sodium Cocoyl Isethionate, Glycerin, Titanium Dioxide, Fragrance, Chromium Oxide, Benzophenone-4, Triethanolamine, Tetrasodium EDTA, Methylparaben, Propylparaben, Green 5, Yellow 5, Blue 1, Ext Violet 2, Orange 4, Red 33. NOTE: If you are making these products for sale, good manufacturing practices recommend you wear a hairnet, gloves and a mask. We also recommend a clean workspace, and wearing a clean apron. Cube 2.4 ounces of Premium Ultra White Soap into small pieces. Add 0.4 ounce of white soap to six different beakers. Microwave one beaker of soap in five-second increments until melted. Be careful not to overheat the soap. Shake the bottle of Stained Glass Forest Green Liquid Color, and add 2 drops to the melted soap. Mix the soap to incorporate the color. Fill the top left bubble in each mold cavity of the Massage Bar Mold with the green soap. Microwave another beaker of soap in five-second increments. Shake the bottle of Stained Glass Strawberry Red Liquid Color, and add 1 drop to the melted soap. Fill the top right bubble in each mold cavity with the pink soap. Shake the bottle of Stained Glass Ocean Blue Liquid Color, and add 2 drops to the melted soap. Fill the middle left bubble in each mold cavity with the blue soap. Shake the bottle of Stained Glass Lemon Yellow Liquid Color, and add 2 drops to the melted soap. Fill the middle right bubble in each mold cavity with the yellow soap. Shake the bottle of Stained Glass Citrus Orange Liquid Color and add 2 drops to the melted soap. Fill the bottom left bubble in each mold cavity with the orange soap. Microwave the last beaker of soap. Shake the bottle of Stained Glass Violet Purple Liquid Color and add 2 drops to the melted soap. Fill the bottom right bubble in each mold cavity with the purple soap. Cube 4 ounces of Premium Extra Clear MP Soap Base and 0.5 ounce of Premium Ultra White MP Soap Base. Place soap in a microwaveable measuring cup. In a small beaker, add 1 teaspoon of glycerin and ¼ teaspoon of Matte Woodland Green Pigment Powder. Use a mini mixer or measuring spoon to incorporate the powder into the glycerin by mixing well. Melt the soap from step 23 in 30-second increments in a microwave. Add the green color mixture from step 25 and 3 mL of Valencia EO & FO Blend to the melted soap, and mix well. Pour the green soap into a silicone mold. We are using Crafter’s Choice Basic Oval, but any basic mold will work. Allow the green soap to harden. Once hardened, unmold. Use a cheese grater to grate half the bar of green soap. The shredded green soap will be the “grass” that we will later embed into our soap bars. Cube 10 ounces of Premium Extra Clear MP Soap Base. Microwave the clear soap in 30-second increments until melted. Be careful not to overheat the soap. Add 9 mL of Valencia EO & FO blend to the soap, and mix well. Check the temperature of the soap. When it is below 130 degrees you can proceed. Liberally spritz the colored “eggs” with rubbing alcohol. Pour a thin layer of clear soap in each mold cavity. This ensures that the “eggs” properly adhere to the rest of the soap bar. Liberally spritz the shredded green soap with rubbing alcohol. Spritz the thin layer of clear soap with rubbing alcohol, and loosely place the shredded green soap into each mold cavity. Pour the remaining clear soap into each mold cavity, leaving at least 1/8 inch at the top, and allow to harden. Cube the remaining green soap, and place in a microwaveable measuring cup. Melt the green soap in thirty-second increments in a microwave. Spritz the top of the hardened soap with rubbing alcohol. Fill each cavity with green soap, and spritz with rubbing alcohol to pop any bubbles. Unmold the soap. If you have difficulty unmolding, place the mold in the freezer for 30 minutes, and try again. Wrap each bar of soap in plastic wrap to prevent glycerin dew from forming.